Root, Flash, Install your Lenovo Device. TWRP recovery is a most popular custom recovery and probably the best touch recovery available on the market for almost 80% of devices including tablets, TV-Boxes even smartwatches etc.TWRP custom recovery can backup your current ROM, kernel, logo, nvram and more also can flash/installs ROMs, Tweaks, Mods, and everything which is builded for recovery flashing. 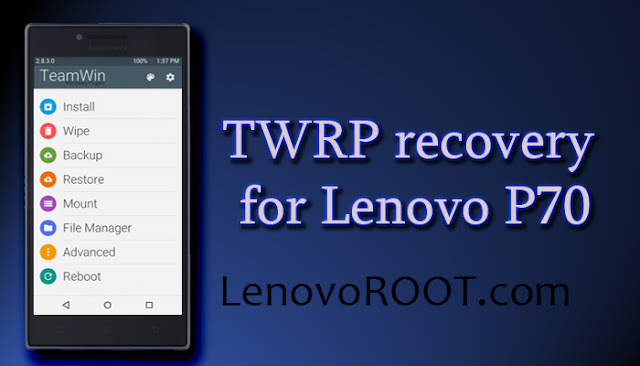 In this post I'll show you How to flash TWRP recovery on Lenovo P70. There's two version of TWRP according to architecture x32 and x64. You can only flash 32bit on 32bit version of Android and 64bit on 64bit version of Android. If you're running on Lenovo P70 Official Android KITKAT 4.4 ROM it's 64bit therefore flash 64bit recovery version, but if you're on Official Android Lollipop 5.1 it's 32bit unfortunately flash 32bit recovery. You need to have a ROOT into your device on this method before doing this! Download from below recovery.img for your OS and version and transfer to phone memory or SDcard(if you download throught phone not needed). Download Flashify from PlayStore (for this purpose I'll using this app there's others in PlayStore). Open app and navigate to recovery image -> Choose image. Go to file explorer and locate file recovery.img from internal memory or sdcard. Select recovery.img and press Yup! When shows Flash complete this means recovery.img flashed successfully. You can reboot to recovery it will appear! That's it, Enjoy of flashing, backing up ROM and many many more things! You don't need from ROOT in this method! You need from USB cable. Download from below recovery.img for your OS and version. Download Sp Flash Tool for Lenovo P70 (for flashing recovery.img) - link. Download Lenovo P70 drivers (zip contains drivers for all OS versions) - link. Unpack Sp Flash Tool zip and open flash_tool.exe(green icon). Load scatter file from right corner and find scatter file(recovery zip contains scatter file or download from below). Press Download button on top (green arrow). Completely turn off Lenovo P70. Plug USB cable to PC then to Lenovo P70. Once flashing finish Green circle will appear on the screen. You can boot into recovery by pressing Vol UP+ Power button until you see black screen with white text. Navigate to recovery with Vol UP and enter with Vol DOWN. That's all, you can do anything with TWRP recovery on Lenovo P70, Enjoy.